The Wilcom FR2 Optical Fault Locator is a rugged, light-weight, hand-held, easy-to use “one button” operation unit for multimode and singlemode applications. This instrument uses patent pending OTDR (Optical Time Domain Reflectometer) technology to make measurements. The FR2 is designed to pinpoint faults in an optical fiber cable, that can be over 10 kilometers distant, with amazing accuracy. The unit operates at the industry standard wavelength of 1310 nm, and can display the distance to a fault in meters or feet. 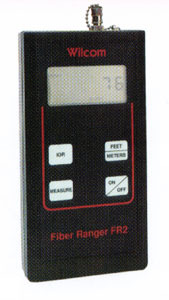 The FR2 is designed to measure the distance to fiber events along fiber cables in optical fiber systems .Useful applications for the FR2 include testing: Wide Area Networks (WANs), telecommunication spans of up to 10 kilometers, Fiber-to-the-Curb applications, installation of single mode fiber cabling, and military systems. The unit is an excellent tool for locating faulty connectors, damaged components, bad splices and breaks in singlemode and multimode cable sections. The FR2 has been designed with the technician in mind with many easy to use features. It has a large LCD display for viewing ease, and can be used on multimode or singlemode cables. Its’ easy “one button” operation is used for activating the unit’s measure function, and the Index of Refraction (IOR) setting can be field selected with the use of a single button. The FR2 is designed to record up to seven multiple events, and display the distance to the event(s). The unit can be equipped with either an ST™, FC, or SC connector that is optimized for multimode or single mode cables. Adapter cables are available to launch into different style connectors. The FR2 is powered by four AA Alkaline batteries that can provide greater than 13,000 operations. An advanced power supply circuit ensures maximum battery life, and a display annunciator alerts the operator of a “low battery” condition. The auto power off circuit turns the unit off 5 minutes after the last reading to preserve battery power. Safety – The Wilcom FR2 Fault Locator is a Class I laser product under the requirements of both the U.S. Center for Devices and Radiological Health, and the American National Standards Institute1. As such it presents no hazard to users who view the output when using proper operating procedures. However, it is recommended that users should not stare directly into the beam. This entry was posted in optical. Bookmark the permalink.